Starting GPS Co-ordinates: N50 95' 20" W001 14' 20"
Finishing GPS Co-ordinates: N50 93' 60" W001 14' 40" or N50 93' 90" W001 15' 20"
To see: Meon Valley Line. Update 22/04/2015: According to the observations of a Mr. Tubbs (see below), apparently this byway has been subject to a clearance programme. It's still a bit tight, however. Even though at its southern end this byway seems fine, what looks like a great byway on the map is in fact so over-grown at its northern end (by Midlington Farm) as to be impassable. 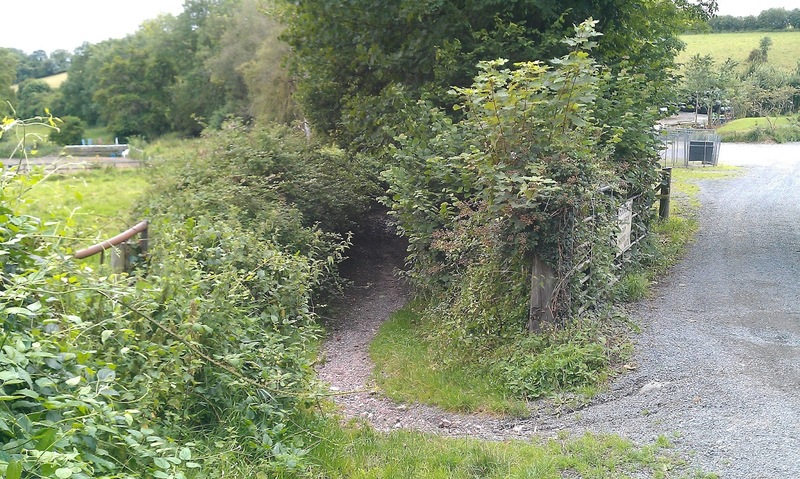 Until a drastic amount of clearance has been undertaken it is best to avoid this green lane. It is, however, possible to 'do a loop' between the two southern ends, and it is a very easy going (and somewhat pointless) drive over fields on an earthen/gravel surface that quickly ends up just down the road from where you began! This is why the lane is rated as a 2 and not a 0. The byway is on the left. Like a bad nightclub: you're just not getting in. The northern end by Midlington Farm is passable but you will get a few scratches...! We did it about a year ago. Thanks for more excellent feedback DrRob! Needless to say we're very impressed that you managed to get through! But I'm afraid to say that, with another year's growth on it (as of August 2012) the northern end is, as you can see from the picture above, quite impassable even for a trail bike/horse. It needs to be cleared. We will keep an eye on it, and if you see any change to this or any other lane please let us know! Cheers. Passed through here today 21/4/15 and seems like they've cleared a fair amount of stuff but it's still a bit scratchy. Thank you Greg! Much appreciated. I have updated this entry with your findings. Passed here today. You could get a small 4x4 - daihatsu, suzuki jimni etc in ok. I was on a trail bike and it was fine. Word of warning though, it is filthy and about 100m it gets very boggy and very deep.